All the way back in December of last year, the children and I had a play with easy fabric dying. Small squares of Aida, soaked in tea and then left to dry, were supposed to become cute little stitcheries. Except we were late in the day getting them dyed, and then by the time they dried, the kids had moved on to other things and I’d moved on to making dinner. So the cute little squares of Aida floated around on my desk for 6 months, and then ended up in my general craft stuff drawer, where two or three clean outs saw them almost thrown out, but at the last second, kept “just in case”. Also in the general craft stuff drawer was a bag of stranded floss gifted to me by AJ in one of HER clean outs. 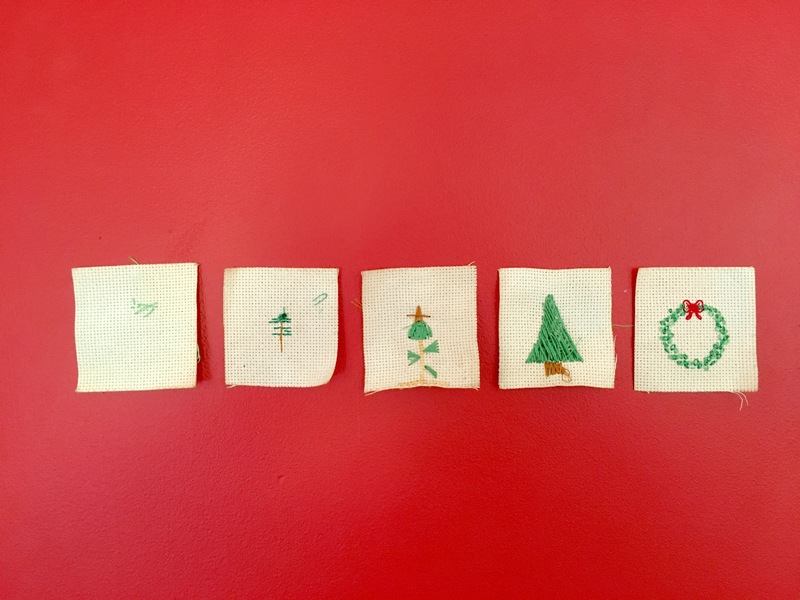 When I started setting up my activities this year, the little squares were one of the first parcels I bundled up, with a selection of Christmassy coloured floss, to create some mini Christmas embroideries. From left above, we have embroidery by Beetle, Butterfly, Boy2, Bear, and myself. I think they turned out so cute! The Aida made it super easy for the little people to work out where to stitch, and to get the needle and floss through the fabric. I think next time, though, I will print off a few examples to give them a clearer idea of what their stitcheries could be. 18 days down…the crafting is kicking in to high gear around here! There are a heap of projects to catch up on blogging, projects still to be made, houses to clean and menus to plan. I have my table runner nearly finished except the binding, a centerpeice to pull together, and jam and gift baking to make. There’s a post office run in my very near future (hashtag kill me now), and I may or may not be counting down until the smalls abscond with their grandmother on Wednesday so I can get my energiser bunny on and get the final presents bought and maybe even wrapping started…but if you don’t leave the wrapping until Christmas Eve, does it really count as Christmas? How else will I know it’s Christmas if we aren’t losing the scissors and hiding the sticky tape?